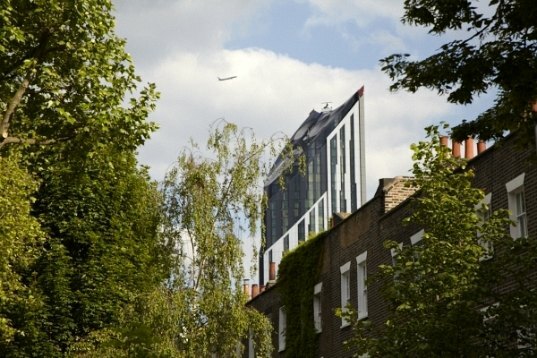 First Skyscraper With Built-In Wind Turbines Opens in London! London recently saw the completion of the world's first skyscraper with wind turbines integrated directly within its building fabric -- the Strata tower. Nicknamed the Razor, the black and silver skyscraper measures in at 147 meters (485 ft) tall, making it the tallest residential building in central London. 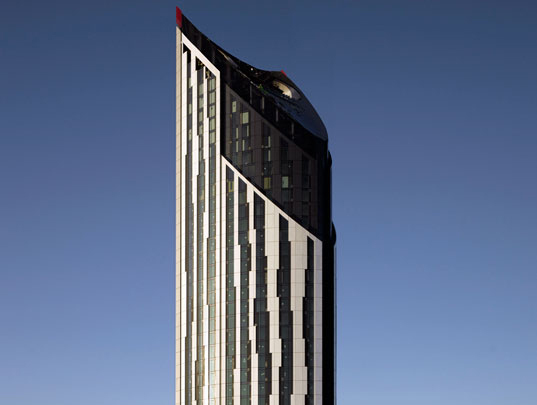 The Strata is topped with three building-integrated wind turbines that provide 8% of the total electricity needs of the building, and it features an array of green building strategies that make it the face of the regeneration of the Elephant and Castle area. Designed by BFLS (formerly known as Hamiltons), the Strata is a 43-story architectural wonder that already has a distinct and recognizable profile in the London skyline. Oriented to take advantage of the prevalent south-west winds, the tower has commanding views into the heart of downtown. With floor-to-ceiling windows, views from each apartment are said to be spectacular, and the architects did their best to incorporate daylighting and natural ventilation with operable windows, even high up in the penthouse. The three wind turbines integrated into the pinnacle of the tower provide 8% of the building’s energy needs, which is enough to provide for the building’s electrical and mechanical services, including three express elevators and automated window cleaning rigs. Construction of the top of the tower and integration of the wind turbines was said to be challenging, as every part of the turbines had to be hauled up via crane. The turbines are designed so that they will not be too noisy for the penthouse residents below. In addition to running off renewable energy, 25% of the development was designed to be affordable housing or for those who earn less than £60,000 a year. So floors 2-10 are affordable flats, while the remaining units are luxury condos all the way up to the penthouse. Markets and shopping areas are close at hand in the Elephant & Castle area, as new buildings and developments are slowly springing up. Two more residential towers are also slated for the area in the near future. this can be so gorgeous. A building that's 1/12th sustainable! Hooray for wind turbines! Located in the Elephant and Castle area, the Strata is expected to help push the regeneration of the inner-city area and spur on new development. At 485 ft tall with 43 stories, the tower is the tallest residential building in central London. Three wind turbines are integrated into the top of the tower, making this the first tower in the world with built-in turbines. The tower is oriented to take advantage of the prevalent winds from the south-west and also to take in the beautiful vistas of the London skyline. The residential tower is 43 stories tall and has 408 apartments, with 25% of those deigned for affordable housing. Natural ventilation and daylighting were key elements in the design of the residences. Floor to ceiling windows offer unparalleled views of the London skyline and operable windows allow for natural ventilation. Over 1,000 people have already moved into the tower so far. The tower is nicknamed the Razor because of its shape. Each turbine has five blades instead of three, which is expected to help reduce noise levels for residents in the building. The wind turbines were difficult to install -- almost prohibitively in fact -- as each piece had to be hauled up via crane. The wind turbines are expected to generate 8% of the building's energy needs, which is enough to cover the electrical and mechanical systems, including three express elevators and the automated window cleaning systems. The Strata is the first of three towers in to be built in the Elephant and Castle area along with other planned developments, which are expected to regenerate the inner-city neighborhood.